What a lovely concert again enjoyed by all! The conservatory was full! 4/5) Drunken Sailor and Maybe It’s because I’m a Londoner – All to join in! 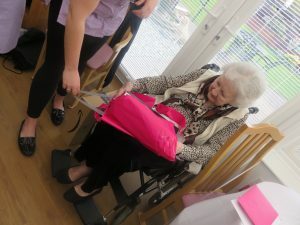 11-14) Old time musical selection – Voice/Piano – All to join in! 24) FINALE: She’ll be Coming Round the Mountain – All to join in! 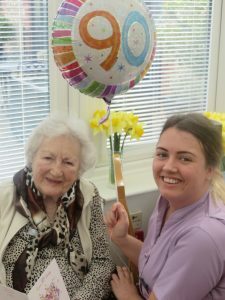 One of our lovely residents celebrates her 90th birthday today. 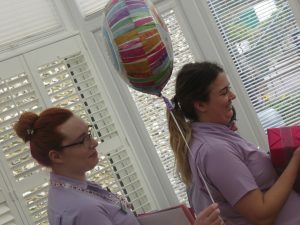 With our best voices we were sure to sing our hearts out to ensure a loud rendition of ‘Happy Birthday to youuuu’ – heard echoing down the hallways! 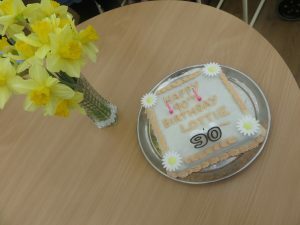 Chef Alison cooked up a pretty (and delicious) birthday cake and our resident received many cards and gifts………….